Mainly the Bigger Venues-in town that also offer an equity contract ever so often. The Landing Theatre Company, Houston’s professional company dedicated to advancing American Playwriting, has a new home: The Landing Theatre @ the Docks! LTC has taken over the theatre venue formally operated by Diverse Works and then the Catastrophic Theater at 1119 East Freeway. 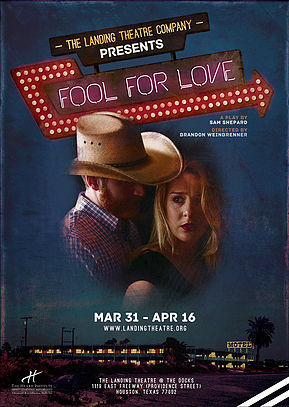 The Landing Theatre Company boldly kicks off their 2015-16 season in its new home with Sam Shepherd’s modern classic: Fool for Love. Set in a seedy motel on the outskirts of the Mojave Desert, Fool for Love is the story of two people who can’t seem to escape each other. May, hiding from her past, is confronted with the abrupt arrival of her life-long lover Eddie, who forces his way in and threatens to drag her back into the tumult she ran so far away from. When ..